Summer is the season so many of us look forward to after the long winters we have in Minnesota. And when the weather warms up, our lakes are packed with boaters eager to have some fun. In fact, Minnesota is home to some of the most passionate boaters in the country. Ask anyone about their favorite lake or stream and you’ll likely trigger a wave of nostalgia reflecting clear, cool waters, heavily wooded shorelines, abundant wildlife and the peace that only comes from a quiet moment on that beloved lake or stream. Do we love our lakes? You betcha! Fun is on everyone’s minds while boating. However, before all the fun and games begin, we need to focus on safety from the moment we hop onto our vessels. A day on the water may be one of the best ways to escape the summer heat, but all fun and play can make for a dangerous day on the water if you don’t keep safety in mind. Safe boating requires good vision, good coordination and the ability to react swiftly. Boating traffic comes from all directions, and floating obstacles can suddenly appear without warning. Driving a boat requires the full attention of the operator, as there can be numerous distractions. A lot of things on the water compete for one’s attention. But don’t let the dream of landing that next big large mouth bass or the possibility of making friends with the boat full of beautiful ladies next to you become a distraction — pay attention to what matters. Remember, boats do not have brakes. Water adds an element of unpredictability when you need to react quickly. Aside from the above-mentioned factors, alcohol has also been linked to 17 percent in all fatal boating accidents. Machine failure, excessive speeding, weather and water conditions also contribute to accidents. Boating and watercraft accidents can range from collisions with other vessels, flooding/swamping, collision with a fixed object, passengers falling overboard and even skier mishaps. Of all these, collision with another boat or vessel is the leading cause of accidents nationwide. It would be nice to think that we would never have to face an emergency situation. Unfortunately, sometimes even when you do everything right, there is always that ‘other bloke! Then again, sometimes mishaps happen that have nothing to do with being on the water, some of which are not under the control of the boat passengers or operators, which was the case for this brand new boat. 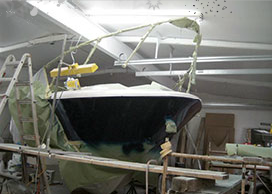 This 2007 Larson 370 Cabrio boat was being shipped to Spain when the crane lifting it was rigged improperly and crushed the hull, and front deck. That’s the bad news. 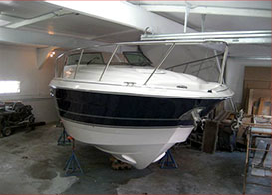 If you have made a financial investment in a boat, then you know there are few things scarier than damage to their prized watercraft. It’s your worst nightmare. A fitting may have failed; perhaps you struck a deadhead; maybe you stuffed a wave, or chopped the throttles to avoid a collision. 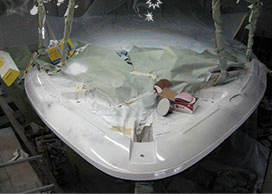 It does need to be the end of your fiberglass boat. This damage can be simple “trailer rash” like small scratches and dings or major structural problems resulting from impact or core wood rot. 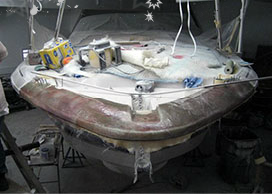 Luckily, fiberglass hulls can be repaired. 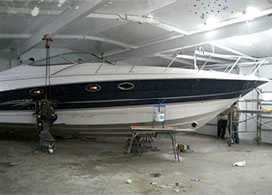 With the right state-of-the-art equipment, high quality products, and cutting edge techniques, a skilled Minnesota boat repair & restoration technician that specializes in collision, structural, and storm damaged boats can restore the beauty of your fiberglass boat to BETTER THAN pre-accident condition! Boating accidents can be caused by a variety of different factors, some of which are not under the control of the boat passengers or operators.